Many games play off of monsters chasing after the protagonists. Running away from the menace or shooting your way through them are some of the ways to deal with them. World’s End has everyone trying to escape an apocalyptic invasion, but there are times when you want to look out for yourself. However, doing that may bite you back later in the game. To find out more about the gameplay, I asked Stacy Vanorman eight questions about World’s End and its Kickstarter campaign starting March 22. What influenced you to design a board game? 3. Have great art to look at. 4. Must have lots of decisions to make that directly affect what happens, as if you were really there. 6. Must have enough cards so you will have no idea what they may draw next. 7. Must have a full backstory and good writing. 8. Players would have to interact with each other as if they were really there in this situation as well. Make friends, lie, cheat, steal, risk get robbed, etc. Why create a monster themed game when there are so many out there? For the last 12 years we have owned one of the worlds largest haunted attractions so as you might think, monsters are always on our minds. If we were going to design a game, creatures in the mist would be part of it regardless if there are 5, 10, or 100 other monster games out there. How do you give the players interaction with each other? Because after the first couple rounds Players are forced to interact with each other for the simple fact there are few supplies. No one can make it through the game without interacting with a number of other players. They may play an assist card and ask for help or play a thief card and just take what they want. Every diction has consequences though. If you are asked for a favor / help and you don’t assist them, you may be left all alone when help is most needed. You have to make friends to get through, but you may need to cut people off by lying if they are a threat to you. What makes this more than a “roll and move” game? This was a HUGE deal while in design. The fact of the matter is there are constant decisions to be made. 2. Who do I help along the way? 3. Should I lie to take the lead and risk getting caught? 4. Should I take a “Risk” when it is presented to me for a possible advantage? Many times, through the game there will be multiple options you have to pick from and because the game is fairly short, every one counts. What kind of monsters will players encounter? Well since we are all fans of monsters we wanted to present an atmosphere of “anything can happen”. If you think of the movie “The Mist” where you have no idea what could be around the next corner… That is the angle we took here. We just didn’t want the game to be predictable. There ARE a series of BOSSES. Bosses require everyone to work together to defeat them. Everyone has to play the required card(s) or everyone has to go back 5 spaces as a penalty. How will the players defeat the monsters? 1. Should I just save the assist card because I am only 2 spaces away from the medical center and save if for a better / more important situation? 2. Who do I think will help? 3. Who has the card(s) I need? 4. Does anyone owe me anything for a favor I did for them? 5. Maybe someone has a lot of cards and probably won’t ask me for a favor in return later. This maybe a good player to ask UNLESS he lies a lot in the game… then forget it. How will the players be competing? Do you have any other designs in the works? The game board layout is based on the downtown layout of Alpena, MI with some obvious changes. We have full intention of designing other boards / versions of other cities around the country as time goes on. i.e. a Chicago, or Washington edition for example. 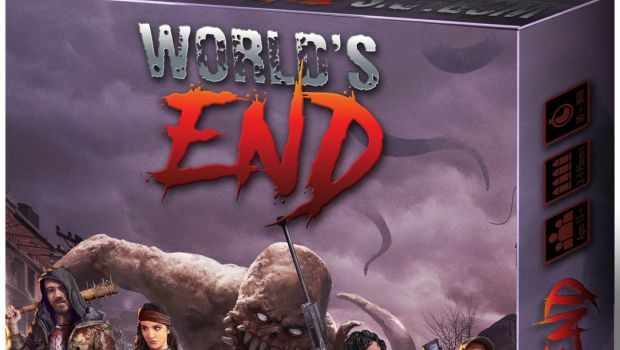 World’s End sounds like an easy to learn experience with a heavy factor of metagaming with the players. Check out the Kickstarter campaign to see if you’re ready to run.